I have lamented in the past that when your brain is stuck on economics, it can be hard to escape from your obsession. For example, I explain here what it's like to be driving around northern Montana wondering why the local population was obsessed with GNP, when everyone knows that the economy is now more commonly measured by GDP. Or here is how I ended up "Endorsing Association 3E: Ethics, Excellence, Economics"--and it tastes excellent on nibbles of sourdough bread. Or here is how the Economic Geyser spouts even in the middle of Yellowstone National Park. 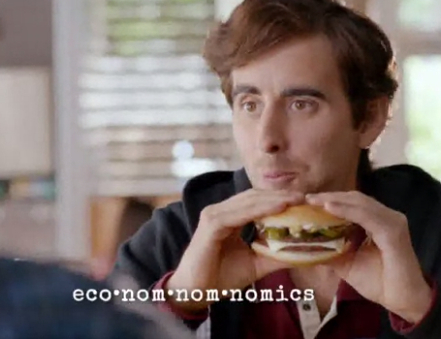 Now McDonald's is messing with my ability to turn off the economics portion of my brain. A few years back they prominently advertised the CBO, which we all know stands for Congressional Budget Office, thus causing me to twitch every time I passed a billboard. Of course, now it's the eco-nom-nom-nomics advertisements. Most of what I watch on television is live sports, and I'm just trying to sit and relax and watch my baseball or football game in peace, when suddenly my brain is jolted into awareness of economics. Please make it stop. Of course, my children think the ads are hilarious, partly because they make Dad twitch. The children are also fans of the "lolcats" books, which are cats with funny but ungrammatical captions (that badly need the work of an economics journal editor to fix them all right now. Sorry, lost my train of thought there for a moment.) Oh yes, the lolcats also say "nom nom nom" from time to time. So now the lolcats trigger thoughts of economics in my mind, too. Thanks a lot, McDonalds. I need another month of summer vacation.